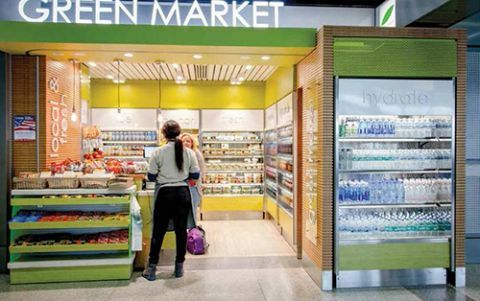 Operators of Green Market, a new grab-and-go concession at Chicago O'Hare International Airport, knew they had a winner even before it opened in March. They trusted the appeal of their concept: healthy foods purchased from local vendors. What they didn't know was how quickly and enthusiastically airport visitors would embrace the current trend. When first-month sales greatly exceeded expectations, the operators started thinking bigger and better. Now, discussions are on the table about opening another storefront at ORD and possibly even taking the concept national. Build-Out Contractor: Ornelas Construction Co.
"America's taste buds are changing," says Manolis Alpogianis, of TAG Restaurants. "People aren't eating everything fried, and they're not drinking as much soda. We came up with something that plays to today's taste buds, and we saw results almost immediately." Specifically, Green Market is grossing three times more sales than the airport and TAG anticipated, he reports. Alpogianis opened Green Market in ORD's Terminal 3, behind the TSA checkpoint near Gate L3, with his longtime friend Ezequiel "Zeke" Flores, chief executive officer of Flying Concessions. The 180-square-foot space was originally intended to be a typical grab-and-go concession with standard sandwiches, bagged chips and soda for quick sale. "As we started talking specifics, we just kept thinking about the way the country is going in terms of food," recalls Alpogianis. "I walked around the airport and saw all the same food. And I couldn't find something that I personally wanted to eat." ORD officials couldn't be happier. "Green Market provides a wide range of fresh, high-quality, locally sourced products for passengers, offering some of the best food and beverage items produced in Chicago," says Ginger Evans, commissioner of the Chicago Department of Aviation. "It's owned by a local minority company, which is a priority for Chicago's airports. And it offers passengers an amazing variety of packaged to-go products, all from a relatively small footprint of space within the concourse." Green Market combines Flores' background in airport concessions, real estate and audit accounting with Alpogianis' experience in the food industry. Both are Chicago natives and chose to run their respective businesses there. The result makes Green Market somewhat unusual, as large national companies often dominate airport concessions. TAG Restaurants is a locally owned business run by Alpogianis' family, which also owns a small chain of restaurants in the Chicago area and has operated America's Dog, a concession in ORD's United Terminal, for the past four years. Flying Concessions, headed by Flores, is a Latino-run concessionaire that was formed to attract strong national retail brands to Chicago airports. Green Market's operational point of difference-its focus on locally grown produce and products from small, local vendors-is also the most difficult aspect for the business partners. "We constantly have our ears very close to the ground with everyone in the local food industry," Flores notes. "I originally had a partner who was very active in the food business. And with TAG Restaurants' experience, I guess you could say it is in our DNA." Currently, Green Market works with eight local vendors that supply everything from hothouse vegetables, artisan salads and protein plates to specialty potato chips, craft sodas, fruit parfaits, and gourmet chocolates. Suppliers include Berghoff Brewery, Goose Island Beer Co., Red Hen Bread, Molino Baking Co., Chicago Classic Confections, Vosges Chocolates and Breadcrumb. While finding vendors is lot of work, it has become a "passion" to ensure that Green Market has a good variety of offerings, explains Alpogianis. For instance, the concessionaire devotes few of its 36 total cooler shelves to traditional mass-market sodas, preferring to save space for power drinks, teas and craft sodas. "If you give people healthier alternatives, they will buy it," he advises. Green Market's homemade salads and sandwiches are developed by Alpogianis' brother, George, who works as an executive chef in Chicago. Items are packaged off site and delivered twice daily to the airport. Although the operators expected good sales at the airport, they were surprised by which particular selections have become the hottest menu items. Roasted root vegetables, for instance, beat out potato chips as the most popular side. "We also didn't know that the Sriracha chicken wrap would be the No. 1 sandwich," shares Alpogianis. "We're outselling them two to one versus a chicken Caesar salad. We didn't realize that all the top-selling items would be the ones geared toward a healthy diet." That's not to say Green Market doesn't sell potato chips. But the chips it sells are locally made gourmet varieties. "We have to have crowd-pleasers, but we also have to bring in good potato chips," Alpogianis notes. Both principals stress the importance of constantly and methodically reviewing inventory. "We have to monitor every square foot," emphasizes Flores. "We continually explore new products, and if something isn't moving, we bring in new products. It's truly a labor of love and is fun." Beyond time, the concession's emphasis on local products also requires framkness. "We want to find local vendors and build relationships with them," says Flores. "But we are also candid and tell them that while we are willing to try a product, we might have to pull it if it is not selling." Like other ORD vendors, Green Market is required by the Chicago Department of Aviation to use "street pricing." Green Market compares its pricing to Whole Foods: sandwiches are $8.88; craft root beer sells for $2 to $3; and small batch chips cost about $2. Flores and Alpogianis declined to provide specific overall sales figures. The partners' commitment to offering healthy, locally sourced food is echoed in the space's building and finish materials. Despite extra expense, the operators chose bamboo woodwork and energy-efficient LED lighting. Build out, which took three weeks, cost $1,275 per square foot, for a total cost of $230,000. Flores notes that Green Market helps the local community, because it is a small business competing among established industry giants. "It's win-win for all of us," he says. "We're local companies adding value to our airport. When the city sees local businesses doing business at the airport, it's great for the city and the state. We would love the opportunity to work with CDA (Chicago Department of Aviation) to open another Green Market at O'Hare." As Chicago natives, Flores and Alpogianis both wear their local pride on their sleeves. "We love our city and we love our airport and we want it to be the best in the world," notes Flores. "We had proposed to the city a great concept to bring in farm-to-table foods, the freshest products, locally sourced, all while promoting local businesses and making healthy to-go food. The airport gave us the opportunity to bring in Green Market, and it exceeded all our expectations. Travelers demand healthy products, and Green Market is a great example of a great concept that we believe will grow not only at O'Hare but also at other airports."